If you’re looking for a change and want to see what Android is like, I don’t think there’s a better phone out there than the Pixel 2 to get the best that Android has to offer. I still think the Pixel 2 is a great phone, assuming you can handle its massive bezels, which look downright shocking in 2019. But I also don’t think that’s the best Android phone to get anymore. As far as I’m concerned, there are three phones most people should get if they’re choosing Android in the US this year: the OnePlus 6T, the Pixel 3 or the brand new Samsung Galaxy S10e. The OnePlus 6T is cheaper, runs more “stock Android” software, is really fast, and will get faster software updates than just about any non-Pixel phone. The Pixel 3 has the most up to date version of Android and a killer camera. Meanwhile, the Galaxy S10e has excellent construction, a better camera, top-of-the-line specs, and a software layer over Android Pie that enhances things instead of degrading things like their software has in the past. Let’s talk about how the Galaxy S10e earns this recommendation1. Oh, and this review will focus mostly on hardware and not software. I have fundamental issues with Android, so this review is not going to address those issues. I’m going to focus all software discussion around things Samsung does on top of Android. The Galaxy S10e is the best Android phone I’ve ever used and excels in terms of display, raw performance, design, and yes, even software. The only serious downsides of this phone are battery life and the camera. The camera issue can be mitigated with third party camera apps, but the battery is really bare minimum for 2019. The best thing I can say about this phone is that I’ve been using it for almost a full month and feel no real rush to run back to my iPhone. Considering how I’ve felt at this point in literally every other “Matt switches to Android” endeavors, that’s a major victory for this phone. Why Samsung? The company really impressed me with their announcement event for these phones and I could not get them out of my head. The hardware looked excellent, and seemed like a meaningful upgrade over what had come before. I was also intrigued by One UI which looked to be a total rewrite of their custom skin over Android. I hated TouchWiz and the Samsung Experience, but this one somehow gave me hope. Why the S10e? It was cheaper and the things it lacked didn’t interest me that much. After seeing other people’s reviews, it seems the in-screen fingerprint reader and curved screens are more hindrances than features, so this phone almost seems superior. I do miss the telephoto lens, though. As an iPhone user, I’m someone who is more than willing to pay more for nice phone hardware. The Galaxy S10e is not quite up to the quality standards of my iPhone XS, but it’s very close in almost every regard, and really trades punches nicely with the similarly priced iPhone XR. The S10e has an amazing display. With a 1080×2280 resolution on its 5.8” screen, it’s nearly identical to the iPhone XS screen. It also has HDR10+ which is great, but in my experience everything looks basically the exact same as the iPhone XS which has the standard HDR10 tech built in. For my money the only time I can tell them apart is when I’m outside on a sunny day. the S10e gets a little brighter and makes it easier to read in direct sunlight. The curved corners on the display look quite striking as well, and compare well to the iPhone’s similar tech. I will say that the S10e has a slightly larger chin than the iPhone, which I don’t think is a big deal and is not something I ever thought about. I know it annoys some people, so it’s worth mentioning that indeed Apple has eliminated the chin better than Samsung here. Where things get a little more divisive is in how Samsung handles the front-facing camera. They have gone with a “hole punch” method instead of the now commonplace notch. I made a video about why I prefer a notch, but my big complaint with this implementation is that it inherently pushes the cutout lower on the screen so it encroaches on more content than a notch that is as high on the screen as possible. This is most visible when watching videos. Lots of content has a 16×9 aspect ratio, and that all looks good with the notch or hole punch, but the issue comes with any video that’s shot at a wider aspect ratio. Tons of YouTubers have converted to 2:1 (or 18×9) which takes advantage of most notched phones, but the lower hole punch on the S10e means that this overlaps on these videos. And you can’t zoom in or out to fix it. The same goes for watching basically any movie, since those are even wider most of the time. I’m also put off by how they integrated the hole punch in the status bar. It looks fine in Samsung’s apps, but most third party apps (and some of Google’s) show a background color on the status bar and the hole punch is not center-aligned with that bar, it’s resting on the bottom of it. This isn’t the end of the world and I don’t know how else they could do this with the hole punch design, but it speaks to how awkward this hole punch is. My overall feelings on the hole punch are that it feels new and fancy, and that’s cool, but I don’t think it added anything practical over a notch and actually made some things worse. This feels very much like it was developed by a team with “anything but a notch” written on a white board in the design room. It is indeed not a notch, but I think this phone would be better if it had one. I just wanted to call out a few small things about the hardware that I found notable. The buttons are all way too high on the sides of the phone. Why, oh why are they pushed all the way to the top?! This is more egregious on the power button which doubles as the fingerprint sensor, which requires me to reach way up to the top of the phone every time I want to use it. The USB-C port is inexplicably misaligned with the other holes on the bottom of the phone. Just a minor complaint, but why? The camera bump on the back is pretty small, and since it’s horizontal and centered, the phone sits very well on flat surfaces. This is way, way better than the iPhone XS without a case. This is not something I would normally put so high in a review, but it’s worth mentioning here as it’s actually a little complicated. On iOS, all authentication methods (Face ID, Touch ID, PIN, or password), but the Galaxy S10e has more authentication methods and those methods have varying levels of security. For example, I can use my fingerprint to unlock the phone, authorize payments in Google Pay or Samsung Pay, and get into password managers like 1Password. I can also use my face to unlock the phone, but not to authorize anything else. And then there patterns, PINs, and passwords which go from least secure (patterns) to most secure (passwords). This flexibility may be welcomes by some, but I personally find it annoying. As someone who has gotten used to Face ID on the iPhone, I love that I can use it to authenticate anything I do on my phone. I don’t have to waste any brain power on remembering if I’m in a situation that requires my finger or face. I like the ability to use both, but I wish that the facial recognition was up to snuff for all authentication needs. I say this because I get so used to unlocking my phone with my face and then I get prompted to use my fingerprint and have to shimmy my hand up the phone to reach the side-mounted fingerprint reader. All that aside, the fingerprint reader is nice and quick, although I really don’t like its placement. I’ve also reviewed the Nextbit Robin which had a side-mounted fingerprint which I hated it on that phone, and I don’t like it much more here. The sensor is nice and quick as you’d expect, but I find I have to put my finger on at specific angles for it to read it properly. This could just be a me thing too and will get better as I use the phone more, but it’s not a problem I usually have with fingerprint readers, so it feels like a regression to me. The facial recognition is nice as well, and is what I use to unlock the phone almost every time. It’s pretty quick, and requires me to look more directly at the camera than my iPhone or OnePlus require, but I’m still quite happy with it. You can speed it up a little by going into settings and toggling the “reduce security” feature which promises to unlock faster, but also means it’s easier to trick with things like a photograph. Use this at your own discretion, but I left it on the more secure setting. The S10e has a 3,100mAh battery, which is 17% bigger than the iPhone XS battery but delivers basically the same results in my use. I’m a pretty heavy phone user, and I don’t jump through any tedious hoops to make my battery life better2. So yeah, not amazing, although I was happy to see that using the always-on screen had negligible impact on the actual time I was able to use my phone. Coming from the iPhone XS, this is pretty much what I’m used to. It does sound like the S10 and S10+ get notably better battery life, so it might be worth spending more on one of those just for the battery if that’s important to you. The camera is the biggest letdown for me with this phone. I don’t think it’s a fault of the hardware either, as the sensors Samsung is using is top notch. Samsung is among the many companies boasting about how much A.I. is going into their imaging systems and how they know what you’re shooting and optimize the end result for whatever you’re looking at. While I see this working wonders on my iPhone and Pixel phones, Samsung’s results are far less impressive. The default camera app on the S10e is nothing if not feature-rich. There’s everything from 960fps slow motion video to portrait modes to professional settings with RAW capture to Instagram integration to even plain old still photos. If you want a default camera app that does it all, then this will have you covered. It’s a shame then, that the fundamental act of taking simple pictures is a bit of a letdown. The problem here is inconsistency. The app is sometimes nice and quick, and sometimes it’s slow to load, slow to switch lenses, and most importantly to me, slow to take the photo when I hit the shutter button. This all adds up to be killer sometimes as I have missed a bunch of photos that I would have really liked to have because the damn photo took literally a second or two after I pressed the button. Worse, there have been a few times where I tap the shutter button and literally nothing happens at all. I have had to tap the button 3 times or more to get something to actually take. This is frankly unacceptable for a camera app in 2019. When the camera does work, it seems to vary wildly in quality depending on what you’re shooting. Landscapes and objects look pretty darn good, and match up quite nicely with the best the iPhone XS and Pixel 3 can do. However, it’s people where the results are far less enchanting. This was at around 5PM and the sun was going down relatively soon, but the lighting was still pretty decent. Still, the S10e made me look like a Ken doll and not a human being. Time and time again, people in my photos look unnatural and frankly a little unappealing compared to what they look like in real life3. But wait, there’s hope! Since a phone is more than the camera app it ships with, I installed the Google Camera app for the S10e and the results were incredibly different. Yes, the Google Camera app, which is effectively the same APK as found on Pixel devices, delivers shots that feel very much like the Pixel in terms of quality and processing style. Frankly, the photos I got from the S10e using the Google Camera app are pretty indistinguishable from the ones on my Pixel 2 and 3. Oh, and you do indeed get Night Shot, which takes photos you simply can’t get with other cameras right now. This is a kind of annoying setup, but if you love the look of photos taken on the Pixel but want the S10e (or any S10 phone) then the Google Camera app will get you what you’re looking for. It’s annoying because the Google app doesn’t get access to everything you can do with the Samsung app, and more critically, the Google app treats the wide angle lens as the standard lens, so you always have to zoom in when you open the app to get the normal lens. Annoying and hacky, but sometimes worth it to get the photo you want. And oh, that wide angle lens! I was most excited about this lens as it allowed me to take photos that were simply impossible on the iPhone. This lens is a little lower quality than the main lens, but it delivers such a wide field of view that this wasn’t a real problem for me. The shots this takes are just incredible! There is some distortion around the edges, but this is a wide angle lens, there’s only so much that can be done here. All I know is that I was inspired to take shots I never would have tried before and ended up loving them more often than not. And then there’s the video, which I found to be quite good. Not as good as the iPhone XS, which is industry-leading as far as I’m concerned, and far better than the surprisingly average video from the Pixel 3. I don’t have much to say here other than to say I trust this video camera just about as much as my iPhone XS, which is a high compliment. Even then, things like 960fps video is something the iPhone XS can’t do, as well as the super-steady mode which stabilizes video very well with a bit of quality loss, but nothing terrible. Thankfully, Samsung includes a settings page where you can trim these down to only the ones you use. The biggest issue I had with the camera actually had nothing to do with image quality and everything to do with shutter lag. Coming from phones like the iPhone and Pixel that have effectively zero shutter lag, the S10e has upwards of a full second of lag at times, which feels like an eternity sometimes. It seems to have nothing to do with lighting or shooting mode either. Just taking a photo in broad daylight lead to noticeable lag. Along the same lines, videos take a second to start recording and also lock up the app for a second or two after you stop recording. Presumably it’s saving the file to disk, but it really should not do this. So yeah, I didn’t do much more with this. Oh, and this doesn’t really fit anywhere else, but I find important: the screen brightness it pushed to 100% whenever the Camera app is open, which I adore. I can’t tell you how often I’ve screwed up the exposure on other phones as I tried to adjust things based on the screen being dinner than normal and making the photo look underexposed. Some people may not have this issue, but it’s a real thing for me and I’m super happy that Samsung though to address it. I have been using the Samsung Galaxy S10e for almost a month now and I can say that it seems to be a very quick phone for almost everything. It’s rocking the Snapdragon 855, the latest processor available, and easily the quickest available for Android devices, so it should be quick. But the big win here is that One UI does not make the phone feel slow at all. Beyond simple app launch times, things like the face unlock and fingerprint readers are quick as well. The fingerprint reader is lightning fast, and is easily the fastest fingerprint reader I’ve ever used. Seriously, you just tap it for a half moment with your finger and it unlocks. And face unlock, while incredibly insecure, is just about as fast as Face ID in getting me into my phone. The OnePlus 6 is still king at face unlock speed, although again it’s worth noting how incredibly insecure that system is too. And as I’ll get into in the next section, Samsung’s UI doesn’t do much to slow things down either, so you’re really getting best in class performance in all things besides the stock camera app. I don’t want to talk about software too much, since it’s hard for me4 to fully separate out my preference for how iOS does most things to Android from the phone itself. Still what is a phone without software, so I’m going to touch on a few notable things, of course with the perspective of someone who knows both OS’s very well and prefers iOS by a wide margin. I have enjoyed the software on the Galaxy S10e more than any other Android phone I’ve used before. Yes, more than the OnePlus 6 and more than the Pixel 3. Since the very first Galaxy S phone, which I flashed “stock Android” ROMs onto almost a decade ago, I’ve always been a fan of the standard Android experience. OEMs simply were no good at enhancing the software, so leaving things as they came from Google was usually the best bet. One UI on the S10e is the first time I’ve used a heavily modified Android phone that I actually liked. There a so many nice touches throughout One UI I’m relatively shocked it came from Samsung. Let me just hit a few of my favorites. First off, they have a very tasteful always-on display feature that is highly customizable. The lock screen can have a collection of photos selected instead of a single image, and it cycles through these every time you turn on the screen. I thought I would hate this, but I really love it. Their launcher is quite solid, supporting easy gestures for opening the app drawer and notification shade. It also supports app shortcuts, which is pretty standard fare these days, but still worth noting. iOS users will be impressed with the level of customization, but Android enthusiasts will likely want something they can tweak like crazy. The skin Samsung puts over Android Pie looks very nice and sports good typographic choices and silky smooth animations on everything. Android nerds will tell you to set the animations to 2x speed, but I say they are perfect. Samsung did not follow Google’s lead with the “pill” multitasking, which I would normally criticize, but in this case is a good call. I really dislike Android Pie’s gestures, so losing them here is more a blessing than a curse. The weather app looks excellent. The dark mode is truly dark and looks slick. I prefer light modes, so I only use this at night, but it makes the UI and all of Samsung’s apps look great. Bixby Routines are super useful. Yes, Tasker does this stuff and probably does more, but I hate-hate-hate that app and can’t stand using it (especially since it likes to show permanent notifications which are maddening. I should write something separate about this, but think of Shortcuts, but with far less functionality but you can have them automatically trigger at certain times/locations with zero input from you. It’s super useful for a few specific situations for me. The Galaxy Store app was featuring wallpapers that played with the hole punch in fun ways, which I thought was kinda fun. But not all is perfect, and there are some things that are pretty rough. While I don’t like Android Pie’s gestures, I do enjoy gestures over buttons, and Samsung really punted here. They have gestures, but they’re just swiping up in one of three places on the bottom of the screen to do exactly what the buttons do. I could not for the life of me get it to select the right location with my voice, and the cards it gave me on screen were zero help in determining which store was the right one. Spoiler, neither was the closest and each were in totally different towns. Oh, and even though Google Assistant works well when using the phone, any accessories, like headphones, that let you do something to pull up a voice assistant can only use Bixby. Supposedly saying “Hi Bixby” should let me pull up the assistant at any time, but this worked maybe one in twenty times for me. Even then, the phone makes you unlock it to actually do anything (even things like checking the weather) so it felt useless and easier to just pick up my phone. I’m going to eject from this feature before I start to really rant, but Bixby needs a lot of work and I truly wish I could just use Google Assistant instead. There are small things like the fact that even after you’ve authenticated with your face or fingerprint, if you tap a notification on your lock screen, you need to make a second swipe up gesture to actually open that notification. Two actions to get into a notification is a small, but constant annoyance for something you do dozens of times a day. Of how the notification bubbles can only be made like half opaque, so some lock screen wallpapers in the stock set make the text of these notifications a little hard to read. That bottom option sure looks a lot like it needs to be checked to proceed, but it’s actually completely optional and opts you into a bunch of marketing and analytics programs you probably don’t want to agree to. You may not see it from this screenshot alone, but even when I knew it was a thing I still tapped this button on a bunch of screens in numerous apps and almost agreed to a bunch of marketing stuff I certainly didn’t want. Finally, there is the standard Android issue of relatively poor third party software. There are a ton of apps, but every single app I use on this phone has a better version on iOS. Fanboys, this is your chance to come at me, but the gulf in software quality for the things I use a phone to do is enormous. Does Samsung Even Like Android? One thing that’s really clear when using One UI is that Samsung is not that into Android. They really guide you through setting up a Samsung account, using their own document and photo storage tools, and push their own apps on you. On first boot, there are two app stores, two browsers, two messaging apps, two emails apps, and more on the home screen. Samsung has their app and then there’s a Google folder with a few of their apps if you’d prefer. I like the choice here, but it’s pretty clear that Samsung would prefer you use their apps, thank you very much. This is fine, but it’s a little jarring when you go between Samsung’s apps and all other Android apps. Samsung is using entirely different UI paradigms for their apps, so their apps work one way and anything from Google or third parties on the Play Store works totally differently. Samsung has a pretty clear vision for that makes a good One UI app and nothing you download for your phone is going to follow those conventions. It’s like Samsung set out to make the best operating system they could, and only built it on top of Android because they needed the Play Store. The Galaxy Store is okay, but there are far fewer apps there than the Play Store, and I would imagine everyone is going to need to go to Google’s app store to get everything they need. Microsoft has a bunch of apps in the Galaxy Store, but almost nothing else of note is there. There’s just a bit of friction between Samsung and Google’s apps, and it’s something I feel all the time when using the phone. This was the first phone I’ve used Android Auto with in any meaningful way, and I have to say I’m disappointed. The car UI is pretty clunky and despite having the fastest phone money can buy, the UI is choppy. Also, the UI has noticeable jagged edges on a lot of elements, which is in part due to my car’s display (driving a 2018 Chevy Cruze), but is not something I noticed was an issue on CarPlay for iOS. I also got numerous instances of audio getting choppy, which makes no sense since all content was downloaded to the device and I was using a wired connection. I guess Android Auto was just a less reliable and weird experience for me than CarPlay. Not Samsung’s fault, but something I noticed. What I do love is that I can run the Android Auto app on the phone itself, so I get the same UI without needing a car compatible. My wife drives the Cruze and I am in a 2013 Hyundai that doesn’t have any smartphone connectivity, and using this makes my car feel a little fancier. The camera bump on the back of the phone is much shallower than the iPhone XS’s and it’s so much nicer day-to-day. I use my phones without a case most of the time and the reduction in wobble is welcome. There’s a headphone jack on this phone! I never used it! Samsung Health is pretty decent. It does automatic sleep detection (only track time asleep, not how you slept) that’s pretty accurate. It also does workout detection and gives you some decent data on your walks/runs. If you have a Galaxy Watch, then you basically need to use this app. I love the little animation that plays around the camera cutout when it’s trying to read your face. I hated Samsung’s emoji set at first, but it’s really grown on me. I still think of Apple’s as the canonical set, but Samsung’s looks really good at small sizes. Certainly better than Google’s set in my opinion. It’s not a slam dunk, but I think the Samsung Galaxy S10e is a killer phone and is easily my favorite Android phone right now. While I normally struggle to use an Android phone for most than a month before dying to get my SIM back into the iPhone, this time I’m quite comfortable sticking with this phone until WWDC this June (I’m a sucker for iOS betas, so iOS 13 will bring me back). That’s three months, which is pretty damn impressive. The first two are frankly things I’d rather not have on a phone. All accounts are the fingerprint reader is slow and unreliable and I don’t like how many accidental touches I’ve had on every curved Samsung phone I’ve used. I do miss the telephoto lens though, and that’s the only real thing that would get me to upgrade. So all in all, $749 for most of the good stuff and none of the bad of the more expensive phones, this really feels like it’s the best option in the lineup. Unless you want a huge phone, in which case the S10+ will be more up your alley. 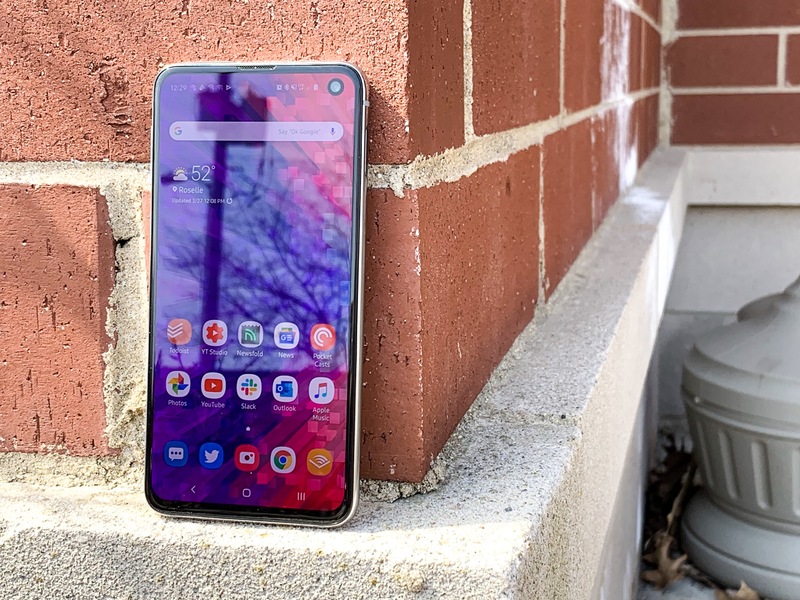 I think the S10e is the best Android phone for the most people, so long as they’re prepared to spend $700+ on the phone. If they want to spend less, I would point them to the OnePlus 6/6t, but that’s a more barebones experience. For nerds, that coupled with much faster software updates makes it more appealing, but One UI makes me feel like prompt Android updates are less meaningful on this phone. If you want the best camera, get the Pixel 3, but that’s really the only reason in my opinion.